When a celebrity is making an appearance on a wrestling show, it is usually something that doesn't go down very well. I mean, sure there have been some fun celebrity cameos in the past, like Arnold Schwarzenegger, Seth Green, Ben Stiller, Hugh Jackman, Shaquille O'Neal, and more. Other celebs were even involved in entertaining angles, like Andy Kaufman, Mike Tyson, David Arquette (on RAW 2010 and the Indy scene), Stephen Amell, Lawrence Taylor, Cyndi Lauper, Mr. T, and even President Donald Trump has contributed some positives to WWE. Some celebrity appearances have not all been as well received as these, however. Many times celebrities pop by for an appearance or even a storyline and turn out so bad, all you can do is cringe with awkwardness. While there have been quite a few of these, I have decided to narrow it down to the top six. American rapper Kevin Federline, best known as Britney Spears' ex-husband, appeared on several episodes of WWE RAW in 2006. Initially, to the audience, K-Fed was just making a cameo to promote his debut album, Playing With Fire. But we would get more, so much more. K-Fed was brought out as a special guest on RAW by Johnny Nitro and Melina. Nitro introduced him as an A-Lister, and one of Hollywood's biggest stars. To be fair, K-Fed was all over the news at the time, as his pending divorce from Britney was made public during this time, but he was still far from an A-Lister. 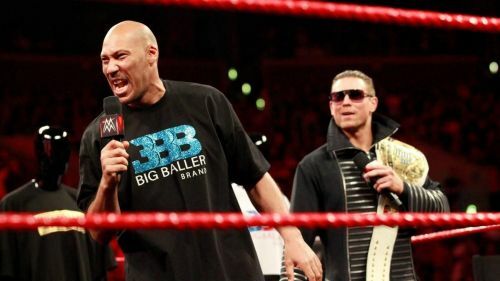 Then WWE Champion, John Cena, would come out to help promote K-Fed's album with a rap of his own, and would then lay out Federline with an Attitude Adjustment. K-Fed would challenge Cena to a match for the New Year's episode of RAW, which was accepted. Over the next two months, K-Fed would appear on RAW to promote the match and have more segments with Cena, he even interfered in the Triple Threat main event of Cyber Sunday, causing Cena to be pinned by King Booker. Come the Cena vs K-Fed match itself, Federline would pin Cena, following a beat down by Umaga and Johnny Nitro. Overall, I think K-Fed actually did well in his role and deserves commendation for still appearing and keeping it together, despite the news of he and Britney's divorce being everywhere. However, he still makes this list because the WWE Champion, whoever he may be, should never have to lose a match to a D-list celebrity. If they had just kept his role to a few segments and maybe managing someone against Cena, K-Fed's stint with WWE would be looked back at in a better light.